"It's a reef. A sea reef. It's off an island. Oh, it's part of an island? Erm it has starfish and other cool looking animals, corals on it. Do i get to see a 'Nemo'?". Probably common retorts and questions if I were to ask a land lover who's never been to our country's smaller islands (Mainland Singapore, Tekong and Sentosa doesn't count!!). I had to admit, visiting and walking on a real sea reef was totally something I have not done before. Even then, I did feel a little apprehensive of going out to sea, when I previously had a near drowning incident - leg cramps while trying to swim out from beach to small land mass on Sentosa. Don't get me wrong, I don't hate the sea. In fact, I did diving and snorkelling before and loved them! I was egged on by my wife to join her colleagues(who are from EESS, an independent non-profit organization) organized trip (by Lee Chew, thanks! ), so I decided to sign up for visiting a reef that 'disappears into the sea' depending on tide timings. For a person like me, who's more into urbex (urban exploration), heritage and urban legends, I am definitely 'A fish out of water' for this latest adventure! So there I was, hunting for proper attire and footgear for my first reef-walking adventure. Got them all at our local 'Army Market' (Golden Mile Food Centre) - Booties, track pants that don't trap/absorb water. Initially there were fears of the walk being cancelled, as there was a heavy downpour with lightning just before. We were all glad it was the usual tropical flash thunderstorm, all we had to do was to wait it out. Meeting Ria for the first time, as she handed out colorful brochures asking us to spot the photo of a stonefish. I was amazed to hear that she's running Wild Singapore all by herself, running her website and it's branches of social media outlets (Just like me and Aaron running One° North Explorers's website!). To add, she's doing regular Cyrene Reef group trips as well! Incredible! It was still raining, when all of us hopped on a boat (or was it a yacht?). It's definitely more comfortable than what I was on when I did my dives in Redang Island/Pulau Aur. The owner of the boat was friendly, even made us some tea that lightened the mood in our group, even as the skies were filled dark ominous clouds. The trip out to the Cyrene Reefs take about 10 to 15 minutes. The waters were slightly choppy due the fact that the Cyrene Reefs lies near shipping lanes. Cyrene Reef, so where does the name come from? What's Cyrene? According to Greek mythology, Cyrene was the daughter of Hypseus, King of the Lapiths. Where Apollo was smitten by her prowess in wrestling a lion that attacked her father's sheep, took her to North Africa and founded the city of Cyrene (in Libya). Right back in Singapore... Cyrene is named in the context of beauty, rightly so as the Cyrene Reefs are indeed beautiful, even so in the eyes of a layman reef-walker like me. Cyrene has stunning seagrass meadows! Lush and vast, the meadows here are home to all but two of the seagrass species found in Singapore. As a result, Cyrene Reef is one of the primary sites monitored by TeamSeagrass. The seagrasses are full of marinelife. In particular, Cyrene is rich in echinoderms: a group that includes sea stars, sea cucumbers, sea urchins, sand dollars and feather stars. In this respect, Cyrene is very much like a Chek Jawa of the South! Despite the rain, our group was in an upbeat mood eager to discover what was sprawled in front of us as the seawater slowly withdrew. For our first ten minutes, everyone was staring intently on the ground for fear of stepping on stonefish or scorpion fish, more than anything else. Slowly we grew accustomed to the reef, started to spot lifeforms with Lee Chew the best spotter in our group. He was practically shouting out to everyone to come see what he found every five minutes or so, he was hyping up the crowd for good reasons! Initially, the photography was tricky for me. Overcast skies with rain, thankfully my hardy camera held up as usual. Been with me for almost 8 years and running, been to the jungles/urban ruins/out to sea; it's a miracle it's still surviving with 'dust bunnies'(dust spots on the camera's sensor) being the only usual complaints. I am indeed very thankful for that! Another guy, Dennis with a DSLR as well, but he decided not to bring down his D300 onto the reef. We all heard stories how cameras could 'die' in such sea environments. Thankfully he had a backup camera! Apart from the first ever sighting on an unidentified Tailed Slug, which got Ria excited, "I have never seen this species here before!" There were other firsts as well, a Spotted Foot Nudibranch, her first sighting on Cyrene Reef. As well as a Slender Seamoth, first ever sighting on Cyrene Reef. There are many more creatures spotted, most of which were unable to identify, but surely we enjoying our time on the coral reef. The sun was setting, which means the tide will come in soon as well. Ria gave out buttons for souvenir to everyone, yay! EESS's treasurer, Lee Chew (and Lai Yoke!) for organizing this trip! To Ria for guiding us on Cyrene Reef, providing us with much insights to the creatures residing on the coral reef. To Francis and his crew for the safe boat rides (and for the warm reception - piping hot cups of tea!). To everyone out there, if you have not visited the Cyrene Reefs. Please do so, at least once in your life! 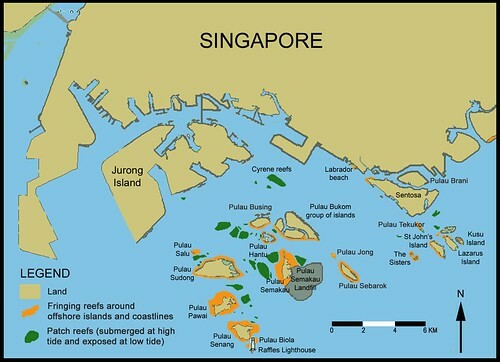 There's quite a bit of land reclaimation going on on Jurong Island, so let's hope Cyrene Reef retains it's splendour for future generations. I am so looking forward for opportunities to visit other offshore locations to do photography!